This is the "We're Back!" issue. 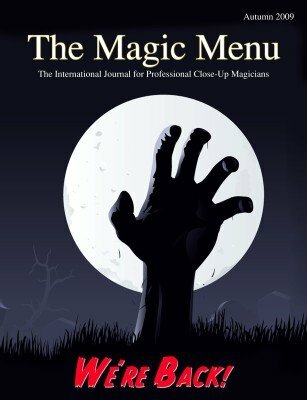 The Magic Menu ceased publication in 2001. In 2009 Jim Sisti brought it back to life expanding the focus to professional Close-Up Magicians rather than exclusively Restaurant and Bar. Jim's observation was that the opportunities for close-up magicians have changed and expanded, which prompted him to change the focus of his magazine, too.